Before the big snow blew in! Well, the snow sure did arrive in these parts. Our first dusting happened on Sunday night/Monday morning. It was Martin Luther King Jr. Day so it didn't effect school or work and it was barely enough to sled in at first. We tried though. We took the boys to Lincoln Elementary School and built a nice sled run with side walls and a ramp. 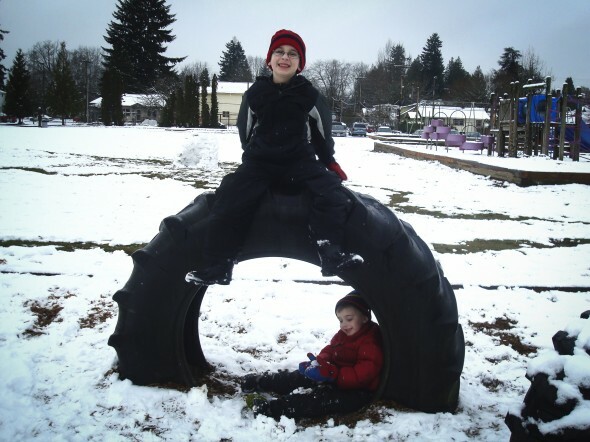 John thought it would be a fun thing for other kids when more snow eventually blew in! School was cancelled on Tuesday. 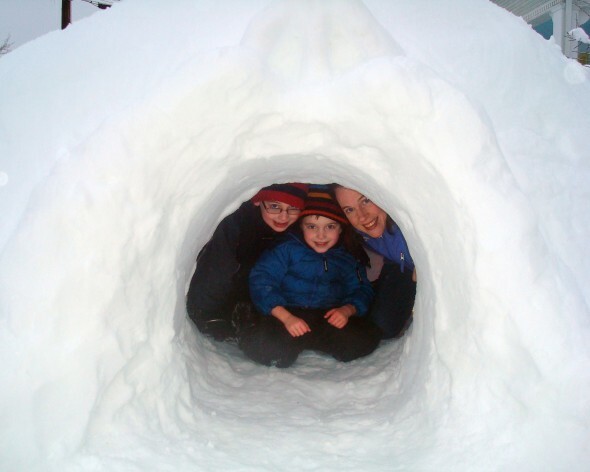 While John was at work, the boys and I started working on an igloo in our front yard. The snow was kind of turning to ice and it was hard work. Ollie abandoned the work early and basically sat on the front porch swing complaining and insisting I make him hot chocolate. I ignored him and eventually he went back inside to warm up on his own. Orion and I toiled away on the igloo for a few hours and then he wandered back inside too. 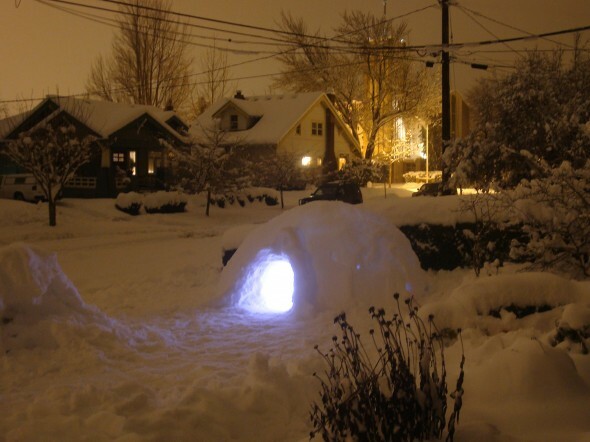 When John arrived home from work I was the lone worker building the igloo. I soon abandoned it too for warmth and dinner. Then we were told there was a second front of snow coming...and lots of it. Well, it came! On Tuesday night we had about 12 inches blow in overnight...at least that's what the news reported for our area. John only measured 10 1/2 inches. Still, that was a lot for one night! The new snow was powdery and covered the igloo nicely, filling in the holes and making it a bit more structurally sound. A good thing! That day State offices were closed, so John went out and completed the work we started while Orion and I headed to Lincoln Elementary School to sled some more. The kids there were really lovin' the sled run we made. Orion recognized some of the kids from his school and said hello. They gave him the cold shoulder and basically made fun of him right in front of us. Orion was oblivious but I knew what was going on. Suddenly, I wished I was Elf in that scene from the movie where he throws snowballs at lightening speed and runs all the mean kids off. I know. Those are cruel thoughts. But I'm a protective mama bear. What can I say!? Now it's Wednesday night and apparently school is cancelled for tomorrow. The rain is supposed to come in tonight and most of the snow should be melting soon but they expect icy conditions on the roads. It's been a fun, short burst of winter snow. Just the way I like it. Too much of it makes you stir crazy. Too little of it makes you long for it. This was a perfect amount. Thanks God! We can even get WIFI in our igloo!